CSC Corporate Domains was busy over the weekend, registering URLs for some familiar occult Nazi and vampire titles. 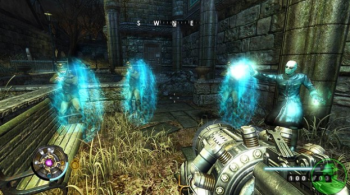 CSC Corporate Domains - best known as an URL registration intermediary - has laid claim to two suspiciously familiar domains: warfornosgoth.com, and wolfenstein-spiel.com. Neither URL leads anywhere fun right now, but who knows what the future will bring? The Wolfenstein URL could well indicate another adventure for B.J. Blazkowicz, erstwhile hero and occult Nazi stomper, who last graced PCs and consoles back in 2009. As for Nosgoth, it's the fictional setting for antihero vampire Kain's adventures, but he hasn't seen the light of day - so to speak - in a very long while. Anything's possible but, of course, we don't even really know who asked CSC Corporate Domains to register the URLs in the first place; cautious optimism is called for. Particularly when dealing with magic-wielding Nazis and jawless ghosts.